Splash Into More Than 23,000+ Colorful Balls! You can practically swim in the balls! This unique bedroom is fun for all ages (There are some weight limits for balls/beds though!). Experience the rush of our indoor, enclosed speed slide. Rock climb the wall only to fall back into the balls below... Shoot baskets across the room AND -- even sleep two people in this unique setting! 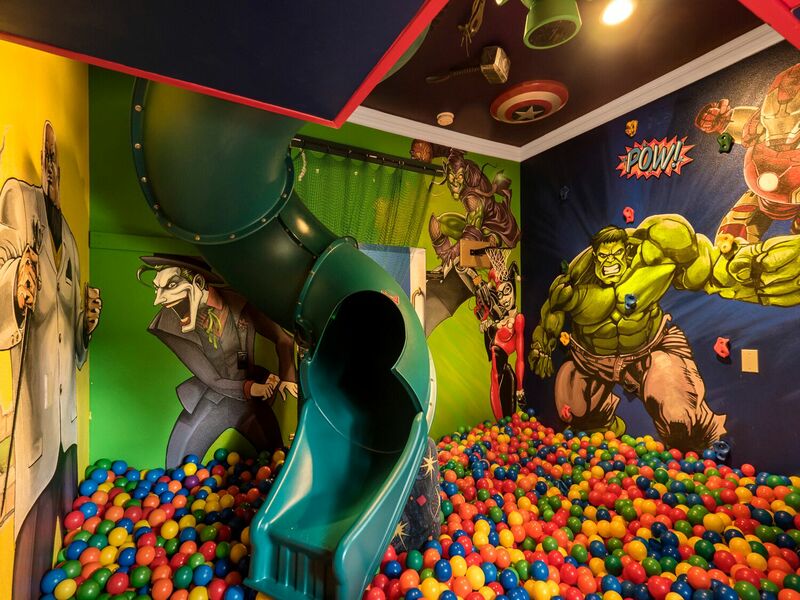 Bounce balls off Captain America's shield while you play our Marvel Vs. DC ballpit adventurechallenge too! 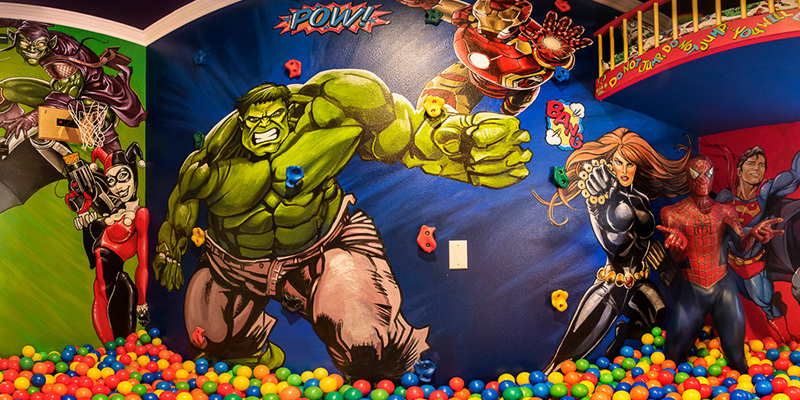 This is the ultimate superhero bedroom and fun space. No other house has anything like it! There are soooo many ways to have fun in and around the ballpit! During their first day at the estate, walk your guests past it while asking them to keep their eyes closed. Have them open the slide and then go upstairs to the speed slide's entrance. They won't be able to see where it leads. Encourage them to go down...and listen to their laughing reactions as they splash into thousands of colorful, air-filled balls! 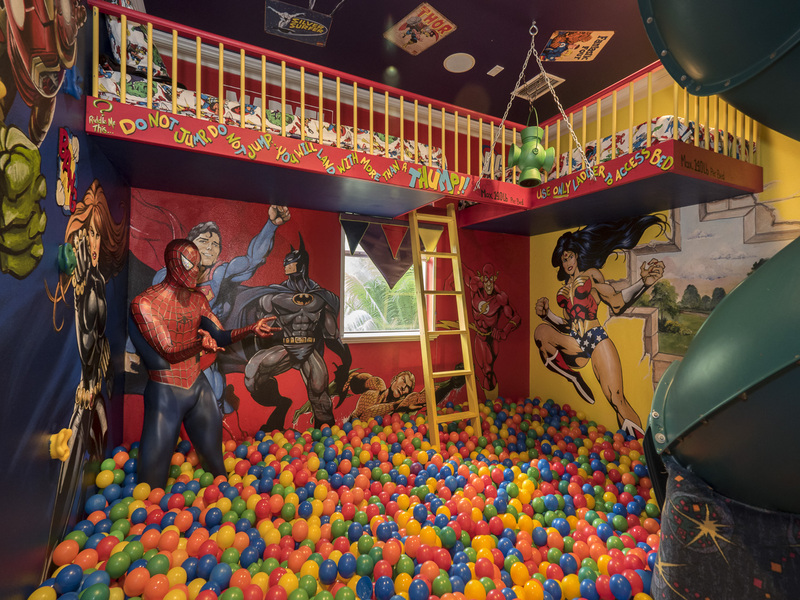 Click the image to your right for a 360 Degree Virtual Tour of the Marvel Vs. DC Superhero Ballpit Bedroom! Did you know that you can also click any image on our site to enlarge it and see more detail? Try it by clicking any ballpit image above!